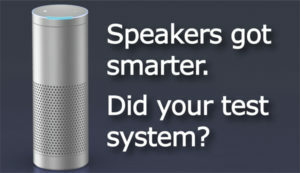 Seminar: Smarter Measurements for Smarter Speakers – Listen, Inc.
Smarter speakers require smarter test methods! Learn how to test smart speakers, robots, voice-controlled automotive audio and other IoT devices in our practical half-day seminar taught by industry experts Dan Knighten, and Marc Marroquin of Listen, Inc. There is no charge for this one-day seminar and lunch will be provided. Space is limited, so please RSVP today. What is ‘open loop’ testing? Can you really measure frequency response and harmonic distortion in an open loop? What voice quality metrics are important for speakerphones?